The Lunae Palus quadrangle is one of a series of 30 quadrangle maps of Mars used by the United States Geological Survey (USGS) Astrogeology Research Program. The quadrangle is also referred to as MC-10 (Mars Chart-10). Lunae Planum and parts of Xanthe Terra and Chryse Planitia are found in the Lunae Palus quadrangle. The Lunae Palus quadrangle contains many ancient river valleys. Map of Lunae Palus quadrangle from Mars Orbiter Laser Altimeter (MOLA) data. The highest elevations are red and the lowest are blue. The quadrangle covers the area from 45° to 90° west longitude and 0° to 30° north latitude on Mars. The Viking I Lander (part of Viking program) landed in the quadrangle on July 20, 1976, at 22°24′N 47°30′W﻿ / ﻿22.4°N 47.5°W﻿ / 22.4; -47.5. It was the first robot spacecraft to successfully land on the Red Planet. The sky would be a light pink. The dirt would also appear pink. Rocks of many sizes would be spread about. One large rock, named Big Joe, is as big as a banquet table. Some boulders would show erosion due to the wind. There would be many small sand dunes that are still active. The wind speed would typically be 7 meters per second (16 miles per hour). There would be a hard crust on the top of the soil similar to a deposit, called caliche which is common in the U.S. Southwest. Such crusts are formed by solutions of minerals moving up through soil and evaporating at the surface. The soil resembled those produced from the weathering of basaltic lavas. The tested soil contained abundant silicon and iron, along with significant amounts of magnesium, aluminum, sulfur, calcium, and titanium. Trace elements, strontium and yttrium, were detected. The amount of potassium was five times lower than the average for the Earth's crust. Some chemicals in the soil contained sulfur and chlorine that were like those remaining after the evaporation of sea water. Sulfur was more concentrated in the crust on top of the soil than in the bulk soil beneath. The sulfur may be present as sulfates of sodium, magnesium, calcium, or iron. A sulfide of iron is also possible. Both the Spirit Rover and the Opportunity rover also found sulfates on Mars; consequently sulfates may be common on the Martian surface. The Opportunity rover (landed in 2004 with advanced instruments) found magnesium sulfate and calcium sulfate at Meridiani Planum. Using results from the chemical measurements, mineral models suggest that the soil could be a mixture of about 80% iron-rich clay, about 10% magnesium sulfate (kieserite? ), about 5% carbonate (calcite), and about 5% iron oxides (hematite, magnetite, goethite?). These minerals are typical weathering products of mafic igneous rocks. Studies with magnets aboard the landers indicated that the soil is between 3 and 7 percent magnetic materials by weight. The magnetic chemicals could be magnetite and maghemite. These could come from the weathering of basalt rock. Experiments carried out by the Mars Spirit rover (landed in 2004) indicated that magnetite could explain the magnetic nature of the dust and soil on Mars. Magnetite was found in the soil and that the most magnetic part of the soil was dark. Magnetite is very dark. Viking did three experiments looking for life. The results were surprising and interesting. Most scientists now believe that the data were due to inorganic chemical reactions of the soil. But a few still believe the results were due to living reactions. No organic chemicals were found in the soil; hence nearly all the scientific community thought that no life was found because no organic chemicals were detected. Not finding any organics was unusual since meteorites raining on Mars for 5 billion years or so would surely bring some organics. Moreover, dry areas of Antarctica do not have detectable organic compounds either, but they have organisms living in the rocks. Mars has almost no ozone layer, unlike the Earth, so UV light sterilizes the surface and produces highly reactive chemicals such as peroxides that would oxidize any organic chemicals. Perchlorate may be the oxidizing chemical. The Phoenix Lander discovered the chemical perchlorate in the Martian Soil. Perchlorate is a strong oxidant so it may have destroyed any organic matter on the surface. If it is widespread on Mars, carbon-based life would be difficult at the soil surface. The question of life on Mars received a new, important twist when research, published in the Journal of Geophysical Research in September 2010, proposed that organic compounds were actually present in the soil analyzed by both Viking 1 and 2. NASA's Phoenix lander in 2008 detected perchlorate which can break down organic compounds. The study's authors found that perchlorate will destroy organics when heated and will produce chloromethane and dichloromethane, the identical chlorine compounds discovered by both Viking landers when they performed the same tests on Mars. Because perchlorate would have broken down any Martian organics, the question of whether or not Viking found life is still wide open. "Vallis" (plural "valles") is the Latin word for valley. It is used in planetary geology for the naming of landform features on other planets. "Vallis" was used for old river valleys that were discovered on Mars, when we probes were first sent to Mars. The Viking Orbiters caused a revolution in our ideas about water on Mars; huge river valleys were found in many areas. Orbiting cameras showed that floods of water broke through dams, carved deep valleys, eroded grooves into bedrock, and traveled thousands of kilometers. Bahram Vallis, as seen by HiRISE. Rotational landslides (slumps) are visible at the base of north wall. Maja Valles streamlined island, as seen by HiRISE. Island formed behind the impact crater at the lower right. Tyras Vallis fan deposit, as seen by HiRISE. Click on image to see layers. Tyras Vallis fan deposit at a different sun angle. The scale bar is 500 meters long. This image is just to the right of the previous image. Nanedi Valles, as seen by THEMIS. Nanedi Valles close-up, as seen by THEMIS. Wide view of Nanedi Valles, as seen by Viking 1 Orbiter Box indicates the position of next image. Close view of Nanedi Valles, as seen by Mars Global Surveyor Arrow points to a small channel that formed after the main valley. This is an enlargement of previous image. Waters from Vedra Valles, Maumee Valles, and Maja Valles went from Lunae Planum on the left, to Chryse Planitia on the right. Image is located in Lunae Palus quadrangle and was taken by Viking Orbiter. Map showing relative positions of several valleys in Lunae Palus quadrangle, including Vedra Valles, Maumee Valles, and Maja Valles. Box indicates where these valleys can be found. Colors show elevation. The Viking Orbiters caused a revolution in our ideas about water on Mars. Huge river valleys were found in many areas. They showed that floods of water broke through dams, carved deep valleys, eroded grooves into bedrock, and traveled thousands of kilometers. Bahram Vallis, as seen by Viking. Valley is located in northern Lunae Planum and the Lunae Palus quadrangle. It lies nearly midway between Vedra Valles and lower Kasei Valles. Streamlined islands in Maja Valles as seen by Viking showed that large floods occurred on Mars. Image is located in Lunae Palus quadrangle. Great amounts of water were required to carry out the erosion shown in this Viking image of a small part of Maja Valles. Image is located in Lunae Palus quadrangle. 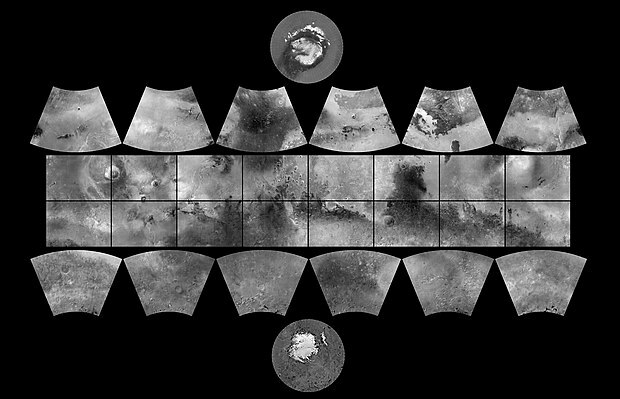 Hypanis Vallis, in the Lunae Palus quadrangle, was one of the sites proposed as a landing site for the Mars Science Laboratory, popularly known as the Mars Curiosity rover. One aim of the Mars Science Laboratory is to search for signs of ancient life, as many Martian rocks occur in a context of hydrogeology, that is, they were formed in water, at the bottom of lakes or seas, or by water percolating through the soil, although Brown University researchers have recently suggested outgassing of steam to atmosphere from a new planet’s interior can also produce the clay minerals seen in these rocks..
Because such issues remain unresolved, it is hoped that a later mission could return samples from sites identified as offering best chances for remains of life. To bring the craft down safely, a 12-mile wide, smooth, flat circle was needed. Geologists hoped to examine places where water once ponded, and to examine its sediment layers. The site eventually settled on for the Mars Science Laboratory was Gale Crater in the Aeolis quadrangle, and a successful landing took place there in 2012. The rover is still operational as of early 2019. NASA scientists believe Gale Crater’s floor rocks are indeed sedimentary, formed in pooled water. Hypanis Vallis, as seen by HiRISE. Scale bar is 500 meters long. One of the most significant features of the Lunae Palus region, Kasei Valles, is one of the largest outflow channels on Mars. Like other outflow channels, it was carved by liquid water, probably during gigantic floods. Kasei is about 2,400 kilometers (1,500 mi) long. Some sections of Kasei Valles are 300 kilometers (190 mi) wide. It begins in Echus Chasma, near Valles Marineris, and empties into Chryse Planitia, not far from where Viking 1 landed. Sacra Mensa, a large tableland, divides Kasei into northern and southern channels. It is one of the longest continuous outflow channels on Mars. At around 20° north latitude Kasei Valles splits into two channels, called Kasei Vallis Canyon and North Kasei Channel. These branches recombine at around 63° west longitude. Some parts of Kasei Valles are 2–3 km deep. Scientists suggest it was formed several episodes of flooding and maybe by some glacial activity. Kasei Valles, as seen by THEMIS. Grooves on wall of Kasei Valles, as seen by HiRISE under HiWish program Grooves may be caused by water moving in the channel. Color view of grooves on wall of Kasei Valles, as seen by HiRISE under HiWish program Grooves may be caused by water moving in the channel. Researchers have found a number of examples of deltas that formed in Martian lakes. Finding deltas is a major sign that Mars once had a lot of water. Deltas often require deep water over a long period of time to form. Also, the water level needs to be stable to keep sediment from washing away. Deltas have been found over a wide geographical range. Delta in Lunae Palus quadrangle, as seen by THEMIS. Delta that fills a crater, as seen by HiRISE. Impact craters generally have a rim with ejecta around them, in contrast volcanic craters usually do not have a rim or ejecta deposits. As craters get larger (greater than 10 km in diameter) they usually have a central peak. The peak is caused by a rebound of the crater floor following the impact. Sometimes craters will display layers. Craters can show us what lies deep under the surface. Fesenkov Crater Central Peak, as seen by HiRISE. Santa Fe Crater, as seen by HiRISE. Close up of gullies in previous image, as seen by HiRISE. Canso Crater North Wall and Floor, as seen by HiRISE. Montevallo Crater, as seen by THEMIS. Image shows a landslide on the north rim. Large troughs (long narrow depressions) are called fossae in the geographical language used for Mars. This term is derived from Latin; therefore fossa is singular and fossae is plural. Troughs form when the crust is stretched until it breaks. The stretching can be due to the large weight of a nearby volcano. Fossae/pit craters are common near volcanoes in the Tharsis and Elysium system of volcanoes. Close-up view of Labeatis Fossae, as seen by THEMIS. Dark slope streaks, as seen by HiRISE under HiWish program Shapes of streaks have been affected by boulders. MOLA map showing boundaries for Lunae Planum and other regions. Colors indicate elevations. Map of Lunae Palus with labels. Dunes and rocks on Mars, as seen by Viking I Lander. Click on image to see more details. Trenches dug into the Martian surface by the Viking I Lander. The color is fairly accurate with the pink sky. The trenches are in the "Sandy Flats" area of the landing site at Chryse Planitia. The boom holding the meteorology sensors is at left. Click on image to see more details. Echus Montes, as seen CTX. Click on image to see a semi-circular deposit (in the upper right) that is a landslide. Ridges, as seen by HiRISE under HiWish program Arrows indicate some ridges. ^ Davies, M.E. ; Batson, R.M. ; Wu, S.S.C. “Geodesy and Cartography” in Kieffer, H.H. ; Jakosky, B.M. ; Snyder, C.W. ; Matthews, M.S., Eds. Mars. University of Arizona Press: Tucson, 1992. ^ Mutch, T. et al. 1976. "The Surface of Mars: The View from the Viking 2 Lander". Science: 194. 1277–1283. ^ Arvidson, R. A. Binder, and K. Jones. 1976. "The Surface of Mars". Scientific American: 238. 76–89. ^ Clark, B. et al. 1976. "Inorganic Analysis of Martian Samples at the Viking Landing Sites". Science: 194. 1283–1288. ^ Baird, A. et al. 1976. "Mineralogic and Petrologic Implications of Viking Geochemical Results From Mars: Interim Report". Science: 194. 1288–1293. ^ Friedmann, E. 1982. "Endolithic Microorganisms in the Antarctic Cold Desert". Science: 215. 1045–1052. ^ NASA Attempts to Quash Mars Rumors. Cara McDonough, August 7, 2008. ^ NASA/Jet Propulsion Laboratory. "Did Viking Mars landers find life's building blocks? Missing piece inspires new look at puzzle." ScienceDaily 5 September 2010. ^ a b Raeburn, P. 1998. Uncovering the Secrets of the Red Planet Mars. National Geographic Society. Washington D.C.
^ a b Moore, P. et al. 1990. The Atlas of the Solar System. Mitchell Beazley Publishers NY, NY. Wikimedia Commons has media related to Amazonis quadrangle.